The play "Shin Sarayashiki Tsuki no Amagasa" was performed for the first time at the Ichimuraza in May 1883 [casting]. "Otsuta Goroshi" (literally "the Murder of Otsuta") is the first part of "Shin Sarayashiki Tsuki no Amagasa". It is staged only to open a tôshi kyôgen production of Kawatake Mokuami's drama. It is one act, divided into 3 scenes. The high-ranking samurai Isobe Kazunosuke has a beautiful concubine called Otsuta, the younger sister of the fishmonger Sôgorô. One of his retainers, Iwagami Tenzô, has designs on the girl and makes advances to her. She repulses him, however, in a somewhat tactless manner, and he vows vengeance. Tenzô is, in any case, plotting to ruin his master and thinks he can involve both Kazunosuke and Otsuta in a general catastrophe. The chief obstacle in his path is the head retainer Urato Jûzaemon. 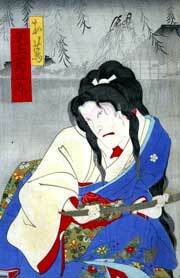 Tenzô plans to slander Otsuta to her master by half-proving that she is having an affair with Jûzaemon's son, Monzaburô. This will probably result in a quarrel between the Urato's and Kazunosuke and the dismissal of Otsuta who may be more amenable to Tenzô's offers. 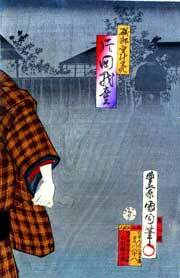 Tenzô contrives a meeting between Otsuta and Monzaburô in the garden at which Kazunosuke shall be present in hiding. 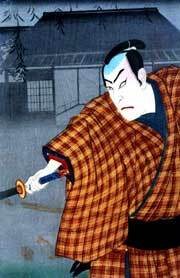 The samurai is suspicious of Tenzô's story, but wishes to reassure himself. He is by nature violent, overbearing and impulsive. The innocent meeting between Otsuta and Monzaburô rouses him to uncontrollable anger. Tenzô's plot has succeeded too well. Kazunosuke throws himself on the two young people. A fight starts in which Kazunosuke kills Otsuta in the most brutal manner. He orders her body to be thrown down the well. Monzaburô, through protesting both his own and Otsuta's innocence, is dismissed from his lord's service. Kazunosuke retires to decide what he must now do about Jûzaemon. Otsuta's ghost cannot rest, as she has been so wrongfully done to death. In a puff of smoke,, her haggard, grey wraith emerges from the well and haunts the house, her unearthly movements appearing as shadows on the paper of the sliding doors and windows. Aubrey and Giovanna Halford in "The Kabuki Handbook"
Onoe Kikugorô V and Kataoka Gadô III playing the roles of Otsuta and Isobe Kazunosuke in the "Otsuta Goroshi" part of the play "Shin Sarayashiki Tsuki no Amagasa"